ESPN.com: Page 2 : We need more costume races! With the season winding down quickly, I was tempted to write about my choices for the MVP awards or about my prediction for the eight postseason teams. But why do that now? No sense picking an MVP when the candidates' performances in the remaining two weeks might make the choice obvious, and no sense predicting the order of finishes when we'll know the real final standings so soon. Instead, I'm going to write about something really important: between-inning costume races. First, it was the Milwaukee Sausage Race. Then the Pittsburgh Pierogi Race. 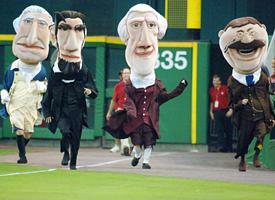 And then the Washington Nationals Presidents Race (Washington, Jefferson, Lincoln and Teddy Roosevelt). And then the Brewers added the Chorizo to their Sausage Race (possibly the team's biggest addition of the season). Purists will claim this is all too much, but the rest of us know it is not nearly enough. If you root for one of the many teams already eliminated from the wild-card race, you know watching a seven-foot Polish sausage or a big-headed George Washington run around the field might be the most exciting thing going this month. It's a simple rule: Everyone loves a good costume race. That is why all big league teams should be required to have costume races. And to get this idea rolling, Off Base offers these race possibilities that provide intense competition and reflect each city's traditions (marketing fees to be determined). Detroit. The obvious way to go would be to sell the race sponsorship to General Motors or Ford and have guys dressed as car models ("And once again, the SUV has run out of fuel in the home stretch!"). Which would work fine. But if four or five guys running around in goofy costumes is good, then 16 or 20 guys running around in goofy costumes is even better. That's why Detroit has to go with Motown Relay Races. "It's neck-and-neck between the Temptations and the Four Tops, with the Supremes closing fast on the outside -- but, oh, no! Gladys Knight dropped the handoff from the third Pip!" New York Yankees. Actually, I like the Yankees' scoreboard subway races. They're not only fun to watch, they tell you which subway lines take you to Yankee Stadium. But does that translate well to a costume race? Guys dressed up as subway trains? Sounds like a little much. 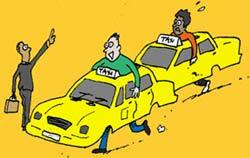 That's why New York should go with another Big Apple transportation icon: Yellow Cab Races. "Cab 1 is stuck in traffic on the FDR Drive. Cab 2 is just crawling along the Henry Hudson Parkway. Cab 3 is backed up for the toll on the Triborough Bridge. And oh, no! It looks like Cab 4 cab is padding the meter by taking the Lincoln Tunnel to the Jersey Turnpike! Geez, that poor SOB will be lucky to get here by the fifth inning." Arizona. Retiree Races. Well, not so much retirees racing as retirees puttering along Camelback Road at 15 miles an hour and sitting through green lights at a busy intersection. Texas. Duh! Texas Ranger Races. "It's the Lone Ranger by a neck over Woodrow Call of 'Lonesome Dove,' followed closely by Walker, Texas Ranger. But wait! Here comes Jack Ruby from out of nowhere!" Minnesota. What else? Twins Three-Legged Races. Chicago Cubs. Oprah Races. "Thin Oprah has a commanding lead over Fat Oprah, Fat Again Oprah, Fat Yet Again Oprah and 'Why Do I Even Bother Dieting?' Fat Oprah." "There's the gun -- and they're off! It's Angelina Jolie by a D cup over Jennifer Aniston, followed closely by Keira Knightley and Halle Berry. They're rounding third and heading for the exit! Remember, the first starlet to the parking lot, inside her car and onto the freeway by the seventh inning wins." Philadelphia. Rocky Races. "It's another close one between Rocky I, II and III, with Rocky IV, V and VI coughing and wheezing and stumbling to the finish line." Tampa Bay. I'm not sure what the characters would be: stingrays or big game fish, maybe. But whatever they are, they wouldn't so much race as just flop around and finish in last. Oakland. Elephant Races. "Heading for home, we have Jumbo, Dumbo, Babar and, once again in the lead, it's undefeated Lord Ganesh!" Colorado. Rolling Stones Races. Sure, you might not think Mick Jagger, Keith Richards, Ron Wood and Charlie Watts could run very well at this stage of their careers, but you'd be surprised. Remember: They're training at altitude. Seattle. 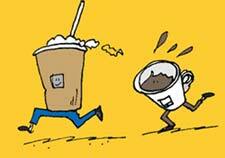 Coffee Races. "And the winner is the Double Tall, No Moo, No Foam, Half-Caf, Triple-Shot with the 50-cent cup of Instant Coffee dragging up the rear!" Anaheim. Is there any question? Disney Character Races. "In Heat 1, we have Mickey, Minnie, Goofy and Pluto. In Heat 2, Donald, Huey, Dewey and Louie, and Uncle Scrooge. In Heat 3, it's Winnie the Pooh, Tigger, Piglet, Eeyore, Rabbit, Christopher Robin, Kanga and Roo. In Heat 4, Cinderella, Snow White, Prince Charming, Happy, Sneezy, Sleepy, Grumpy, Dopey, Bashful and Doc. In Heat 5, Ariel, Belle, the Beast, Lumiere, Cogsworth, Timon, Pumbaa, Mufasa, Rafiki, Aladdin and Princess Jasmine. In Heat 6, it's Baloo, Mowgli, Woody, Buzz Lightyear, Nemo, Jiminy Cricket, Pinocchio, Tinker Bell, Peter Pan, Wendy, Mary Poppins, Mulan and the Queen of Hearts. In Heat 7, it's Brer Rabbit, Brer Bear, Brer Fox, Lady and the Tramp, the Fantasia water-carrying Broomsticks, and Chip 'n' Dale. And in Heat 8, it's all the bears from the Country Bear Jamboree and Captain Eo. Whew! Looks like they're all lined up and ready to go -- wait! We've run out of time again. Better luck tomorrow night." Florida. Marlins Races. Only there isn't any race because Jeffrey Loria sold all the costumes and fired the competitors. Cleveland. Rock 'N' Roll Hall of Fame Races. "Looks like Chuck Berry is going to hold off Jimi Hendrix, John Lennon and Elvis -- and oh, you hate to see this kind of brazen behavior -- he's rubbing it in by duck-walking across the finish line!" Boston. Kennedy Races. 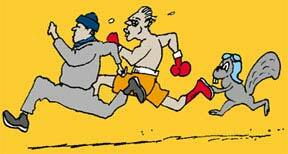 "JFK, RFK and Jackie O are neck and neck, but oh, no -- it looks like Teddy took another wrong turn at the bridge." Kansas City. Barbecue Races. "In Lane 1, we have the Slab of Ribs. In Lane 2, the Pulled Pork Sandwich. In Lane 3, the Sliced Brisket. And in Lane 4, it's the still-winless side of Baked Beans." Chicago White Sox. Drunken Fans Who Attack The First-Base Coach Races. No, wait. They already did that one. Houston. 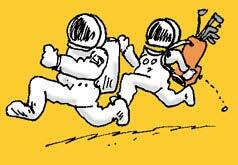 Do you go with Astronaut Races? "We have John Glenn in Lane 1, Neil Armstrong in Lane 2, Alan Shepard in Lane 3 and coming out of retirement again in Lane 4, the Rocket Man himself, Roger Clemens." Or Spacecraft Races? "Sputnik went out fast, but Apollo 11 and the Space Shuttle have closed the gap. And it looks like SkyLab is falling out of it." I don't think you could go wrong with either, really. Toronto. Royal Canadian Mounted Police Races. "It's Sgt. Preston, followed by Dudley Do-Right, followed by Nelson Eddy, followed by either that guy from 'Due South' and/or one of the background singers in Monty Python's 'Lumberjack Song.'" Baltimore. Racing Crabs. "Scuttling their way across the outfield, we have the Maryland Blue Crab, followed by the Chesapeake Crab, the Crab Cake and the pubic lice." Atlanta. "Gone With the Wind" Races. "Rhett is in the lead by seven lengths over Mammy. Scarlett is chasing after Ashley. And Melanie fainted at the start and can't go on." San Francisco. There are a couple of ways they could go here. They could play up their local transportation and have racing cable cars. Or they could give a nod to their local foods and businesses -- "It's the Sourdough Bread Loaf by a nose over the iPod." But I think the most intriguing possibility would be embracing the city's famed tolerance for alternative lifestyles. Gay, Lesbian and Bisexual Races. "It's going to be close between Melissa Etheridge, Ellen DeGeneres and Lance Bass, with Tom Cruise still at the starting line and maintaining that he's ineligible." St. Louis. Budweiser Races. But the competitors have to fork over $7.50 to run, then stand in line for an inning to use the bathroom after the race. San Diego. 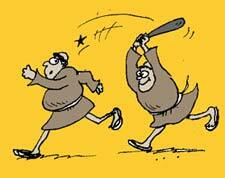 Friar Races. Doesn't matter what they name them just so long as they look like the Padres mascot. I love watching that guy. New York Mets. Mr. Met Family Races. "It's Mr. Met by three-quarters over Mrs. Met, Grandpa Met, Uncle Met, Cousin Met and Mother-in-Law Met." Cincinnati. Frankly, I don't know what characters they would have race. But Pete Rose definitely will bet on them. Remember last winter when Red Sox Nation lowered its 2004 World Series championship pennant to half-staff when Theo Epstein stepped down as general manager and how excited people were when he returned? Well, Boston fans are facing a reality check this year. All general managers make good deals -- heck, ex-Mariners manager Woody Woodward traded for Randy Johnson -- and they also all make bad ones. And St. Theo's deals aren't looking all that great recently. A couple of trades in point. In 2003, he traded Freddy Sanchez and Mike Gonzalez for Jeff Suppan and others. Suppan was 3-4 with 5.57 ERA for Red Sox in 2003 and signed with St. Louis after the season. Sanchez might win the NL batting crown this year, and Gonzalez was 24-for-24 in save chances as Pittsburgh's closer before developing a sore elbow. Earlier this season, Theo traded Josh Bard and Cla Meredith to San Diego to get Doug Mirabelli back to catch Tim Wakefield. Mirabelli is hitting .186; Bard is batting .317 as Mike Piazza's backup, and Meredith is 6-1 with a 0.69 ERA. The only thing louder than the ball popping into the catcher's glove that night was the sound of Boston fans cursing. It's finally official. Atlanta's streak of division titles ended when it lost to the Mets on Tuesday night. The streak began in 1991, when Atlanta was in the NL West, Milwaukee was in the AL East and Jeff Francoeur was in first grade. Atlanta finished a combined 110 games ahead of its opponents in those 15 seasons (including 1994, when it was six games behind first-place Montreal when the season was canceled early). How dominant was Atlanta? During that span, Atlanta played 128 postseason games -- more than the Brewers, Royals, Tigers, Devil Rays, Expos/Nationals, Rockies, Reds, Rangers, Dodgers, Phillies, Pirates, Cubs, White Sox, Orioles and Padres combined (126). Atlanta also played every team in the National League in the postseason except for the two teams (Brewers and Expos/Nationals) that did not reach the playoffs. The last time Atlanta did not play in the postseason, Dwight Evans did. Although Atlanta still isn't officially eliminated from the wild-card race, it would have to make up five games and, more important, leapfrog six teams. That's not going to happen, but the franchise deserves congratulations for an amazing run. The Cardinals might wind up as the only team in the NL Central with a winning record. How many times has that happened? More times than you would think. It has happened 10 times since the leagues went to three divisions and happened four times before that. This week's category: On The Other Hand, They Didn't Win A People's Choice Award. Q: After winning last year's World Series MVP award, Jermaine Dye is a top candidate for the AL MVP award. Name the two players who won the league MVP the year after winning the World Series MVP. A: Bob Gibson in 1967 and 1968, and Mike Schmidt in 1980 and 1981.